Sugar City, Idaho, is far from Las Vegas. The diminutive farming town, tucked along Idaho’s southeast border, has fewer citizens than Caesars Palace. To compare, Centennial High School’s enrollment of roughly 3,000 students nearly doubles the secluded settlement’s population. So when Chase Barber made the move to Las Vegas to live with his mother in November, the senior wrestler realized his new school housed more than six times the number of students enrolled in his previous institution. "It was a culture shock, but I was ready for it," Barber said. "I’ve visited my mom throughout the years, and she has always lived in big cities." For anyone else, such a move would be burdensome. But the 5-foot-10-inch Barber executed the same philosophy he used in capturing an Idaho 3A state championship last season to ensure a smooth transition. "I went into that tournament confident," said Barber, who finished the season 45-4 at 170 pounds for Sugar-Salem High. "I knew what I had to do to win. I wasn’t looking for quick wins. I was OK with wrestling a full six minutes. I just rode out the matches and kept a straight head." That same bulldog mentality proved beneficial when Barber chose to attend Centennial. The wrestling program, spearheaded by fourth-year coach Steven Wike, was quick to accept him and his unique skills. "The thing about Centennial, despite the size, I think it lends itself really well to something similar for Chase," Wike said. "Centennial is Vegas, and it’s a large school. But even around here there are a lot of horse properties, and a lot of the guys on my team are good ol’ country boys." While Barber’s wrestling pedigree speaks for itself, the allure of sparring on a consistent basis with star heavyweight Jordan Karst proved advantageous. Karst, however, was somewhat wary of his new transfer teammate. "I was iffy at first because I didn’t know what weight he was," Karst said with a laugh. "But I was also excited. I’ve gotten so much faster practicing with Chase. He has numerous setups and shots, and if I’m not thinking, it’s going to get me. I can honestly say, there are some matches I would have lost if I wasn’t practicing with him." Despite jumping two weight classes, Barber, who competes at 195, has remained unaffected by the shift. He carries a 32-1 record with a team-high 22 pins on the season. "There actually isn’t too big of a difference for me at 195," said Barber, who has wrestled since the age of 6. "I’ve jumped at least one weight class or two every year of high school. This is my natural weight, so I’m used to it." Barber placed first at the Bulldog Grappler on Jan. 4, leading Centennial to a team title. Wike says Barber’s competitive nature and positive attitude have set him apart from his competitors. "His most obvious strength is his athleticism," Wike said. "When you see Chase wrestle, he’s very technically sound. You watch his movements, they’re deliberate. He’s not flopping around. He’s not snaking a weak move. That is something that will be beneficial in getting him to the next level." 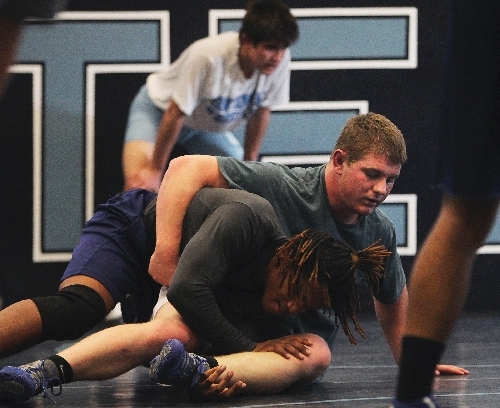 Centennial, which finished ninth in last season’s state tournament and fourth in the Sunset Region meet, qualified five wrestlers for state in 2012. While Barber believes he can continue that trend, he plans to focus on this weekend’s Five Counties Invitational in Fountain Valley, Calif., as a possible steppingstone to a state title. The meet pits the Bulldogs against roughly 70 schools and is noted as one of the country’s most competitive tournaments. "Right now my goal is this tournament that’s coming up this weekend," Barber said. "I want to do well in that tournament. But obviously, I want to win regionals and then hopefully state." Contact John W. Scafetta at jscafetta@reviewjournal.com or 702-383-0430.